Get the latest in Server Technology! Call ANS today! Building on over 30 years of server industry leadership, HP announces a bold new compute strategy to help customers thrive in the era of Big Data, mobility and the cloud. Traditional server silos are too inefficient and slow for the New Style of IT. HP is reimagining the server and thinking instead about compute — the vast pool of processing resources that are converged, software-defined, cloud-ready and workload-optimized for business growth. 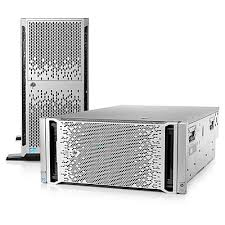 Now available, HP ProLiant Gen9 platforms with Intel Xeon E5-2600 v3 processor series: BL460c, DL160, DL180, DL360, DL380, ML350, XL230a (HP Apollo 6000), and XL730f (HP Apollo 8000). Designed for an easy fit anywhere, HP’s tower servers are offered in standalone and rackable versions and give you a whole new level of control. Designed to accommodate large amounts of internal storage, always ready for I/O expansion, and delivering extraordinary built-in management features, these servers offer unprecedented scalability and leadership price/performance.